Some of this equipment can be scheduled by registered and approved users. To request registration, please email broholm@jhu.edu. Scheduling occurs via Google calendar. You can inspect the current schedule for each scheduled piece of equipment. Once registered users can reserve time on scheduled equipment by accessing the corresponding calendar through their google calendar account. To schedule this equipment, please use the calendar. Crystal growth using a four mirror image furnace has been used to grow and study a variety of bulk crystals, particularly single crystals of metal oxides. In the optical floating zone technique, the basic concept is that four ellipsoidal mirrors are used to focus the light from halogen (or xenon) lamps onto a vertically held rod shaped sample to produce a molten zone, which is then moved along the sample in order to grow a single crystal. The maximum operating temperature of halogen and xenon furnaces are ~2200 C and ~3000 C respectively; and gas pressures of up to 10 bar (1.0 MPa) can be used within the growth chamber. 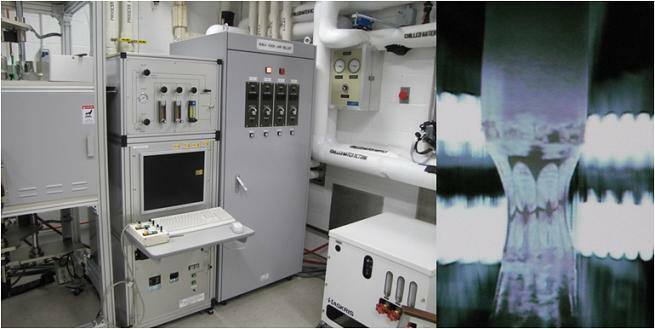 The use of light heating makes the technique suitable for both conducting and non-conducting materials, a feature that distinguishes image furnace growth from float zoning using induction or electron beam heating, both of which are limited to use with conductors. Although light heating is not suited to all materials (it struggles, for example, with those metallic samples that exhibit a high reflectivity in the infra red region), it is particularly convenient and efficient for those oxides and semiconductors that absorb infrared easily. Thus, probably the group of materials for which image furnace growth has been most used are what may be termed functional oxides, crystals of which find applications in lasers, electronic and optical devices, catalysts, solid oxide fuel cells, memory and magnetic devices, oxygen and magneto-optical sensors and as superconducting materials. Furnaces including box furnaces (max. temp. 1200C and 1700C), horizontal tube furnace (max. 1200C) and vertical tube furnace (max. 1800C) are operated to perform solid state reactions and sintering procedures for preparing powders, and feed rods that can be used in the image furnace. The Physical Property Measurement System is a versatile instrument that measures a broad range of magnetic, transport, electro-transport and thermal transport properties of systems. Heat capacity, AC and DC resistivities, thermal conductivity, ac susceptibility, DC magnetization and the Hall Effect are just some examples of properties of bulk or thin lm samples that can be measured using this system. In addition, our Quantum Design PPMS is supplemented by a state-of-the-art Dilution Refrigerator that operates at a wide range of temperatures from room temperature down to 50 mK. To schedule use of the PPMS, use the above calendar. Grown crystals are aligned using the back-reflection X-ray technique. In this technique, the conditions for diffraction are met by using “white” X-rays, i.e., a continuous spectrum. Thus, although the specimen is a fixed single crystal, the variable necessary to ensure that Bragg’s law is satisfied for different sets of planes in the crystal, is provided by the range of wavelengths in the beam. Thus each set of crystal planes chooses the appropriate value lambda, from the “white” spectrum to give a reflection according to Bragg’s law, n(lambda)=2dsin(theta).